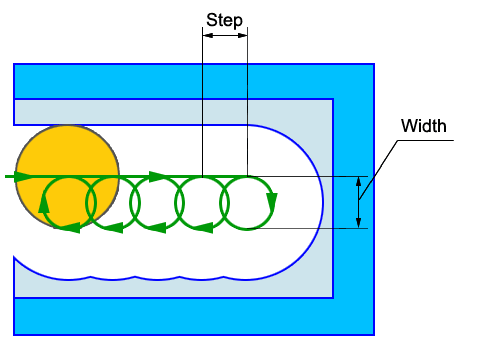 High speed cuts is formed by the adding an additional circles to the tool path. This method allows to reduce the NC data much in comparison with the trochoid and at the same time secure the tool. <Do not use >. With this mode the additional circles will not formed in any case. Attention: If the pocket step more than the half of the tool diameter or smooth radius is assigned then unmachined islands can be remained. It is obligatory to make the visual check of the tool path in the <Simulation> mode. Attention: If machining step great then half of tool diameter or tool have corner radius, then can be rest of material islands. You must visually check this machining at <Simulation> mode.